Ford's 2018 Expedition will be the first redesigned Expedition this century. It will use the frame from the Ford F-150 and have aluminum body panels. LAKE JOSEPH, ONT. — Ford leads Canada in utility-vehicle sales, but currently leaves “white space” to its competitors that it intends to close, an executive said. Gonzalo Contreras, product marketing manager for crossovers and SUVs at Ford of Canada, said three vehicles coming to market over the next two to three years are intended to grow Ford sales. “We are Number One in SUVs, and we are Number One because of the vehicles we sell,” Contreras said. 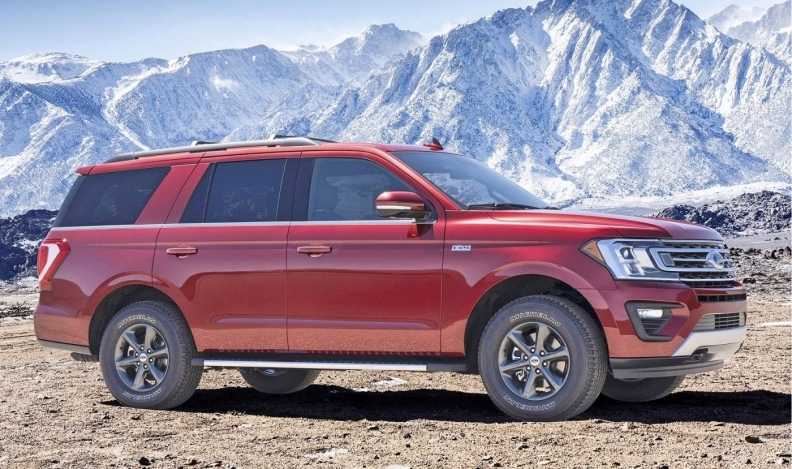 The 2018 Expedition fullsize utility vehicle — the first redesigned Expedition this century — and the new EcoSport compact utility are due out in the next year. Filling a long-vacant spot in the Ford lineup — a vehicle with the image of a true off-roader such as the Jeep Wrangler or Toyota FJ Cruiser — will be the midsize Bronco, due out in 2020. “We are very excited,” Contreras said of the Bronco, announced at the 2017 North American International Auto Show in Detroit, Mich., in January. “We know it has a very loyal customer base. You go on the website, and there are many groups who have been asking for it for years. “So yes, that is a white space, and we know the segment is growing and this will be an excellent way for us to keep growing. The Bronco was last seen as a 1996 model. The Expedition, which since 1998 has received only updates, has its sights set on the Chevrolet Tahoe and GMC Yukon. Combined sales of the two outpaced the Ford Expedition, 5,904 units to 3,729, in 2016. The Expedition remains a body-on-frame vehicle, but it will be based on the current-generation F-150 and will have an aluminum body. That, along with other advanced materials, saves about 150 kilograms. The vehicle also gets a new turbocharged 3.5-litre V-6 rated at, depending on the model, either 375 or 400 horsepower, and 470 or 480 pound-feet of torque. At the other end of size spectrum, nested between the Focus small car and the Escape utility vehicle, is the EcoSport. It’s a nameplate that has been in the Ford portfolio in other parts of the world since 2003. It will compete with the Honda HRV, Toyota C-HR, Mazda CX-3 and Chevrolet Trax, among others. The EcoSport comes with a 1.0-litre four-cylinder or a 2.0-litre four-cylinder engine and optional allwheel-drive. Pricing has not been announced, The 2018 Expedition will start at $61,789 for the XLT, including $1,790 freight, and top out at $82,789 for the Platinum. That’s a significant jump from the current base price of $47,948 and more than the base price of a Chevrolet Tahoe ($59,620, including $1,800 freight). Ford spokeswoman Christine Hollander said the price differences reflect the level of content customers actually buy. Meanwhile, Ford has tweaked Escape, Explorer, Edge and Flex to try to keep sales momentum rolling. FordPass, a system that lets smartphone users find their cars, check fuel levels and even start the vehicles from anywhere in the world, is now available on most Ford utility vehicles.